Copper and brass Alberta pendant, can also be custom made in different metal combinations. Sterling silver tree trunk ring, four different designs available. Silver pendant with copper accents, can be custom made with different metals and accents. OOAK silver flower ring with blue CZ. Water cast flower with silver shank ring, OOAK. Not for sale. 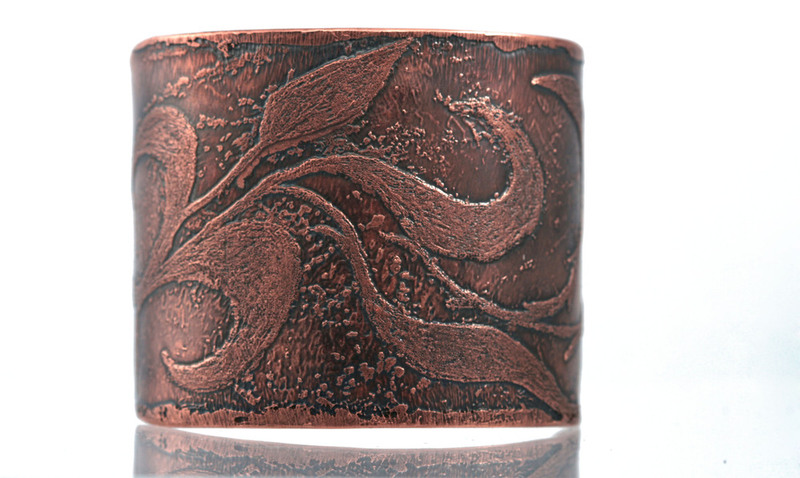 Etched copper cuff bracelet, not for sale. Silver leaf pendant with patina, sold out, custom pendants can be made. Blue baroque pearl earrings sterling silver ear wires. Anodized aluminumn pendant, sold out. The inspiration for my work comes from nature: its shapes, forms and ever changing elements. Growing up on a farm, I discovered vast fields and endless lines of trees. Trees improve air quality, conserve water, house wildlife and help with climate control; they also provide an immense array of nutrients for the environment through decomposition, becoming nurse logs or mother stumps. My love of trees and their cyclical connection to the earth can be found in many areas of my work including my metal work, jewellery and landscape photography. One of my artistic goals is to educate the wearer or viewer about my love of trees, nature and our planet. I want to highlight not only the beauty trees possess but also to create awareness and respect for this planet through my art practice. Amanda Clark was born and raised in Ontario. She grew up on her family farm with her father and grandparents. Living on a farm and exploring the surrounding habitat helped keep her grounded and connected to the natural environment. While she was growing up, she realized that her favorite subjects in school were art related. As a teenager she received her first film camera from her Uncle she entered a local photography contest, which she won first place in the student category. After high school she decided to take time away from school to explore other opportunities but ultimately decided to pursue her love of photography at Sheridan College in Oakville, Ontario; where she received a diploma in Applied Photography. After enrolling at the Alberta College of Art + Design, and experimenting with a number of media and visual art classes. Amanda chose to major in Jewellery and Metals and received her BFA.